• Encouraging involvement of the private sector in BTVET. • Giving technical advice and support for the SSU reform process. • Monitoring and evaluation of the education sector and capturing its best practices. • Supporting Skills Development coordination structures at sectoral and at district level. Setting up a Pilot Skills Development Fund SSU aims to empower public & private partners to collaborate on innovative approaches to Skills Development for youth, women and girls through competitive calls for proposals. The experience from this pilot fund will shape the national Skills Development Fund, which will contribute to a trusted environment for combined publicprivate funding at a transitional stage. In the Albertine-Rwenzori region the Skills Development Fund promotes joint-ventures between training providers and the local private sector, against the backdrop of an expected oil-infused economic development.This component is funded by the Belgian Government for €2,000,000. In the refugee hosting districts of Northern Uganda, the Skills Development Fund through instant-trainings strengthens youth, women and girls from the refugees and their host communities to obtain the skills needed to find or to create a job in the settlement economy or in preparation of the economy back home.This component is funded by the European Union Trust Fund for €2,600,000 and part of the Support Programme for Refugee Settlements in Northern Uganda (SPRS-NU) aimed at Stability and Addressing the Root Causes of Irregular Migration and Displaced Persons in Africa. In Karamoja, the Skills Development Fund through instant-trainings promotes incomegenerating and livelihood activities as well as skills relevant for the local labour market. Focus lies with Karamojong, youth, girls and women. This component is funded by Irish Aid for €1,190,000. Public, private Not-for-Profit BTVET providers that are licensed by Ministry of Education and Sports (MoES) and members of the Uganda Association of Private Vocational Institutions ( UGAPRIVI). They must be accredited by Uganda Business and Technical Examinations Board (UBTEB) or the Directorate of Industrial Training(DIT). NGOs (National and International), Trade associations of informal sector enterprises or cluster organisations. To meet the holistic needs of the trainees and reduce risks that threaten to limit learning opportunities. Life skills to support trainees’ ability to make informed decisions and communicate effectively. To develop coping and self-management skills that may help them lead healthy productive lives. It can be pre-training (max of 3 months); in parallel; or preferably integrated into the skills development. These will include literacy and numeracy training, and additional language for specific baskets based on specifically identified needs of the trainees. Equip trainees with knowledge and skills to enhance or develop their entrepreneurial mind-set, and create awareness about entrepreneurship as a viable alternative to paid employment. The entrepreneurship training will be in accordance to national or international standards and instruments, and a minimum of six (6) hours of individual or small group coaching. Supporting and conservation of the environment through reduction in environmental damage, increased energy security, resource efficiency and resilience to climate change. energy security, resource efficiency and resilience to climate change. Training that integrates occupational health and safety issues in the behaviours and practices from job analysis to execution. Skills that stimulate and support integration into the labour market. These include numeracy and literacy to empower trainees especially those in the informal sector to be responsive to the changing market and support successful self-employment. Achieving sustainable livelihood upon graduation requires access to proper materials and capital, enabling graduates to overcome capital constraints, through start up kits, social capital through groups and linking them to financing will promote entry into the labour market or self-employment. Integrating technology in skills development to promote adaptability and flexibility. Training/upgrading master craft persons for improved workplace based learning. The master crafts from the private sector will be trained in pedagogical skills while instructors from training institutions will upgrade in technical skills. This is acquisition of knowledge and skills through carrying out and reflecting on tasks in a working context. It is career awareness and exploration, hands on, work experience, structured training, and/ or mentoring at the work site. It allows students to “taste” and “live” the actual job and working conditions whilst allowing employers to test and train their future employees. Questions about the SDF grant applications? The Skills Development Fund (SDF) by Enabel aims to stimulate bottom-up initiatives and partnerships between Business, Technical, Vocational Training and Education (BTVET) institutions and the labour market. It supports a series of joint ventures between training providers and the labour market in order facilitate transition from the world of training (training institutions) to the world of work (the institutions of the private sector and the labour market). The learning and experience from the intervention will shape the development of a National Skills Development Fund. Last week of June we concluded the signing of grants by 14 successful applicants in the Albertine and Rwenzori Region. The grants will support relevant skills development in the region with emphasis on skills needed for oil exploration in Uganda. This is the second call under the pilot Skills Development Fund (SDF) for Albertine and Rwenzori. SDF supports joint ventures that equip youth especially women and girls with skills that are on demand in the labour market #Skills4Jobs. Promoting employment for 200 refugee and host community youths in Adjumani through skills development. Completed applications shall be addressed to The Project Coordinator or Co-Coordinator SSU Project and submitted to the SSU project offices in Kampala or in the field as hard copies. Breaking down skills provision into its smallest possible form, a voucher scheme is set up to provide qualitative and flexible ‘instant trainings’ to answer to training demands of beneficiaries identified by other agencies supporting livelihood and income generating activities, hereby addressing humanitarian concerns through a development approach. What is a voucher? And what is the SDF training voucher? A voucher is a bond of the repayable (redeemable) transaction type which is worth a certain monetary value and which may be spent only for specific reasons or on specific goods. 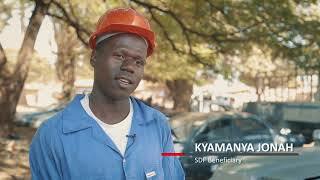 How does the SDF training voucher scheme work? 6. Every month, the training provider provide supporting documents to SSU/ SDF Unit in order to cash vouchers in. • Specialized skills required by operators in support of “emerging local economy” in the Albertine and Karamoja regions and in support of the “settlement economy” in Northern Uganda. Given the demand oriented nature of the voucher scheme, this initial list of trainings will be regularly updated.